Sheet metal Addon for FreeCAD - Projects, anyone? - Projects, anyone? Update 29 Apr 2016: Updated Ulrich Brammer’s Unfolding tool to ver 17. Thank you Ulrich! As part of doing home made projects one needs some kind of CAD software to design mechanical parts. 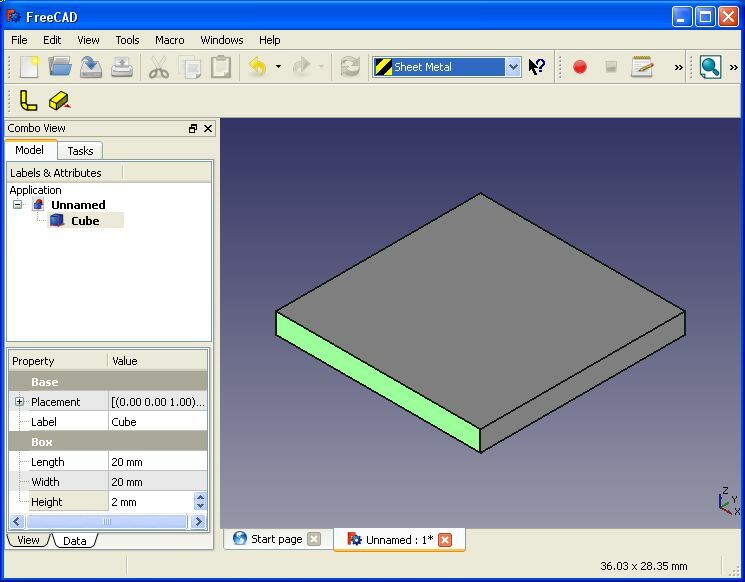 As a fan of open source software I use FreeCAD which is a great alternative to the market’s highly expensive Solid CAD software. One thing I use a lot, is designing Sheet Metal parts. 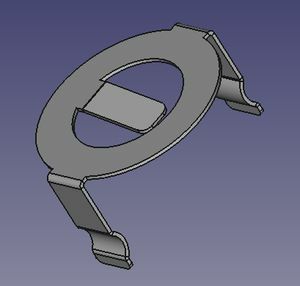 As there is no special support for it in FreeCAD, it tends to take time to design Sheet Metal parts, as I need to manually add sketches, extrude walls, and add fillets. Furthermore, If I found something to be wrong in the base part, I have to go over the entire process to fix it. This is where open source software shines. If I need a new feature, I can just go ahead and add it. Turns out FreeCAD is very friendly to extensions. So I decided to add a sheet metal extension and share it with others. One thing worth mentioning: there is this guy who is working on a sheet metal extension which will probably be far better then mine, but until he releases it, my extension can help speed up part design. To use the sheet metal extension, first you need to install the latest version of FreeCAD (0.16 at the time of writing) if yo dont have it already. You should now see a new directory under Mod: SheetMetal. 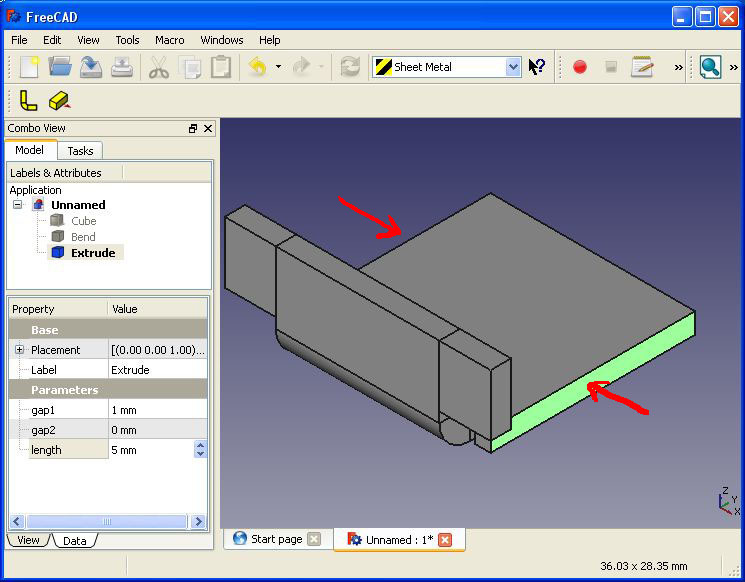 Upon completion of the sheet metal part, you can select the OpenScad workbench and use the Refine ( ) tool to cleanup the geometry. That’s all! Hope it helps someone. Over time I will try to add some more features and keep the above SheetMetal.zip updated. You are welcome to leave comments and suggestions. Update 13 Jun 2015: Ulrich Brammer’s Unfolding tool Added. Thank you Ulrich! Very well, thank you !!!! Amazing! Works like a charm. I get a McAfee malware warning when I try to download the sheetmetal workbench. Anyone knows about this? Use Ubuntu 0.15 FreeCAD (4671 Revision Number). I copied the directory /usr/share/freecad/Mod/ but FreeCAD does not load the module. What you could be happening? Yes, exactly this. FreeCAD should ave already created this directory if you have run it before. Thanks for making this workbench! I’m getting this error: revAxisV referenced before assignment. I made a few bends, then made a cut and tried to make a bend from the cut surface. Is there some inherent limitation that I am running into? I need you to send the problematic part. I sent you a private mail. This appears to be just what I am looking for. I’m investigating FreeCAD as a starting point for models to go to G-Code for engraving/milling on brass sheet using a Shapeoko, Stepcraft or similar. The models are for 7mm/1ft scale railway locomotives. The intention is to engrave/mill brass sheet to achieve the same results as chemical etching but with much shorter lead times on minimal production runs. Any information about the ability of the Sheet Metal add-on to cope with intersecting tubes? These would be tubes of differing diameters and offset centres which then need to be reduced to flat sheet for milling. Sorry, but I can’t really tell. You should try some simple models to find out if it works for you. You can use the FreeCAD forum to ask others for their experience / tips. Nice work, works fine. But I would change two things: For one, the angle specified should be the angle inside the two legs, i.e. 45° should specify a sharp bend and 180° should be no bending at all. Length should specify the length on the “outside”, not the length of the straight piece that is added; to be correct, the originating piece will have to be made “shorter”. In the case of 45 deg, I can see the logic, but then for a 180 deg bend, which now will be 0 deg, it can be a bit strange. I agree though, regarding the other remark. Anyway the problem is, as it is a parametric feature, any changes to that will not be backward compatible and will mess with existing saved files. So since it is not that critical, I tend to leave it as is. The sheet bending machines I know are programmed like this (angle between legs, distances measured to the virtual point where legs would cross, on the outside of the bent part), it is a convention, but probably the only one that makes sense. The radius and elongation of the sheet metal depends on the specifics of the bending tool used to manufacture it; while modelling, I don’t want to bother about elongation-faktor and so on. Like it is now, you have to explicitly compensate for elongation. I don’t know FreeCAD well enough, but there has to be some mechanism in place to deal with backwards compatibility and saving. Having a struggle getting this mod to work. I’m using Linux Mint 17 – apparently one has to install PySide manually on this platform. I installed python-pyside3 (and all its dependencies). That got the the workbench to display. Then I found that installing the older python-pyside (etc…) got the three icons to display. Now, for the life of me, I cannot figure out how to get those tools active. They’re greyed out. I have a simple extrusion of a sketch (i.e. rectangular prism), and no ammount of clicking can bring those tool buttons to life. Uninstalled anything python3-pyside. Added anything else left in SYnaptic with python-pyside. No change on extrusion. Tried it on a box. Now they light up for the extrusion. And nothing happens. Trying to add a bend to either object juts fails. There is data on it in the property view, but that’s all – no bend displayed. Its very disappointing – it looks like a great tool! The tools are grayed until you click on a single face of your object. Try doing it on a simple 10x10x2 box created in the Part workbench. I have no Linux to debug it, so if it still not working, try asking at the freecadweb forum. hiya, thanks for the response. Turns out Linux Mint’s default repository provides an old FreeCAD version (13.something). Update to 15 and it works well – many thanks. For all those who have similar issues / make my mistake, see this page for the ppa. In Windows 7 it should work without any issues. Make sure that under the Mod folder you see a SheetMetal Folder. 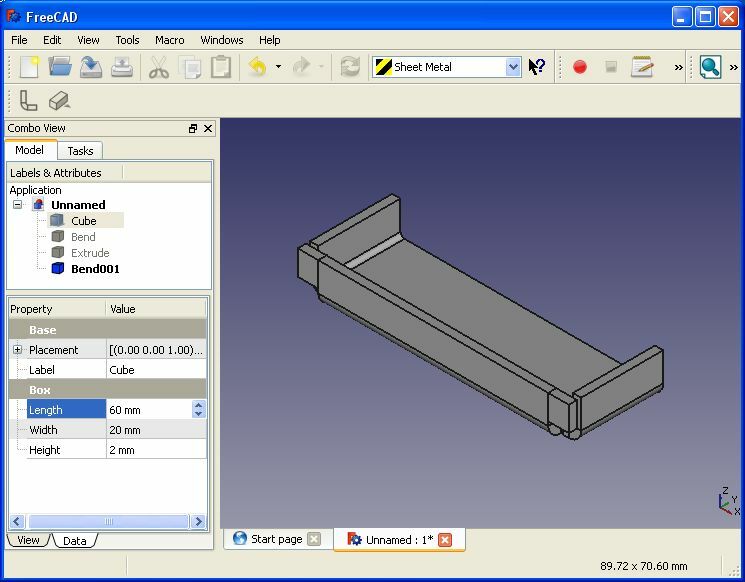 Then run FreeCad, and look at the main tool bar, there is a drop down menu, you should see there a SheetMetel option. Only when you select it, you will see the new SheetMetal buttons. Thank you so much. Wow! Is there an option anywhere to add a stiffener to a flat side? That would be great. Can you post a link for an example of a stiffener? Awesome piece of work! I need to model a cabinet made entirely of bent sheet steel so I can add components to it. I don’t know where I would be without this… well actually I do. I’d not be doing the model and I’d be getting my mods wrong. I have unzipped your file and copied to mod folder. After launching FreeCAD and selecting Sheet Metal Workbench all icons are disabled, any clue? Never mind, it is working. Thanks for your great work. 1). How do I delete just the rear extruded part of the left bend?. I have tried different ways but it seems I can only delete the last added part and have to backtrack all the way. Is that right?. 2). Let’s say I want to model a U-shaped bracket with two bends (material thickness = 0.050″, inside bend radius = 0.050″ both at 90 angle) and the outside dimension between two bends is 1″ (width). Is there a way to use the bend tool so that I can keep the width fixed at 1″ while I change the bend radius without having to calculate and edit the cube width everytime?. 3). What measuring tool and how do I use it to accurately measure the width?. I have tried the Measure Distance tool and it does not seem to snap to two lines perpendicularly; e.g. returning close values but not exact 0.05 for material thickness (more like cursor point to point distance). I appreciate all the efforts that developers have put into making these great tools and sharing them. Thanks. 1. 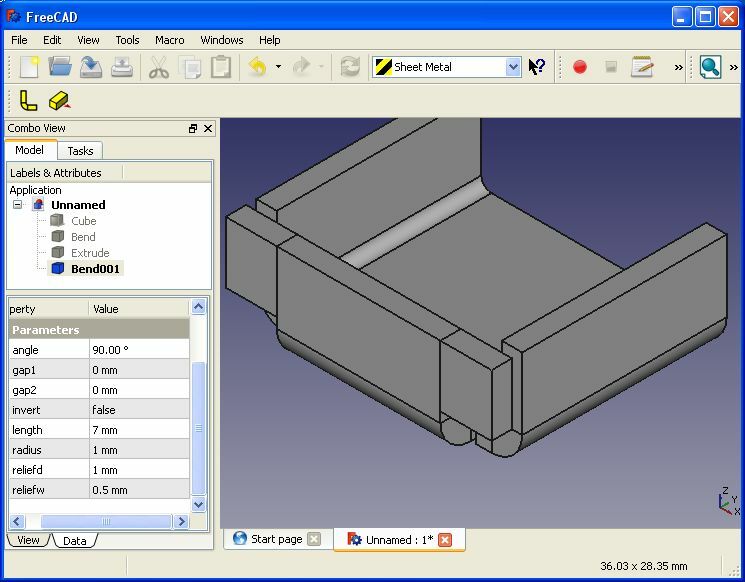 The way freecad is built, you cant delete just the rear bend. It is all model over model based and you can backtrack only from the last action (similar to undo). Changing sizes of the rear bend can be done at anytime, tough, so if you need to change it, its possible. You can even try to set bend angle and bend length to 0 as a hacked way do delete it, but in most cases it can lead to destroying the other bends. 2. Sorry, but yo cant set a fixed outside width, so you can play with parameters without changing the overall width. This is not FreeCad this time, this is a limitation of my workbench. I had already get some requests regarding that, but had not the time ywet to implement it. Thanks for your quick reply, very much appreciated. 1). Understood. I guess one would have to replicate an object to be deleted and use Boolean function to make a cut somehow?. 3). Yes, I did look up in the FreeCAD help forum and someone suggested Part WB/Measure Linear tool. It works for what I wanted to do. It would be great to have something like a Universal Measuring WB that can measure anything in any work space and conveniently turn into dimensions, if required to save time. So far I like your Sheet Metal WB very much. I am not so sure how to quickly design a metal case for electronics using FreeCAD without your WB. Thanks again. Just go to http://freecadweb.org/wiki/?title=Download and click “Windows 64 bits” download option. Then run it as any other installation. Thank you sir. I already have it downloaded, I do not understand how to mod and extract the file on this page. Make sure FreeCAD is not running. Download the file from this site. Double click on the file to enter the zip. Right-Click on “SheetMetal” folder and select “Copy”. Right click on “Mod” folder, select “Paste”. If Windows asks you for permissions, grant them. Run FreeCAD. You should now see the new workbench in the list. 120deg bend. Is this possible with the SheetMetal module? To get a -120 deg just set it to 120 deg, and change the “invert” property to “true”. Never mind… I didn’t try “invert”, which does what I want when set to true. I followed the guidelines to install SheetMetal_V0.0.16 in the Mod directory but it doesn’t show up in the WB-dropdown list. I cannot figure out why FreeCAD does not load the module, I got no error, no warnings. I put the files in data/Mod instead of Mod directory. Your work is great. And it is working fine. But is there any way to do projected shapes in sheet metal. Do you mean to flatten the shape into the sheet metal? If so, you need to click on a face of the object and click on the flatten button. See the end of this post. Not like that. It just like make stamping operation. Ah.. Then sorry, there is no option to do that. I am trying to use your 0.0.17 with FreeCAD 0.16 on Windows. Love that you no longer nest objects differently from FreeCAD itself. P.S. Google captchas are horrible. 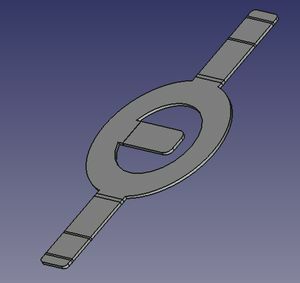 After flattening a part, is it possible to get the proper dimensions from the flat piece so the part can be fabricated? 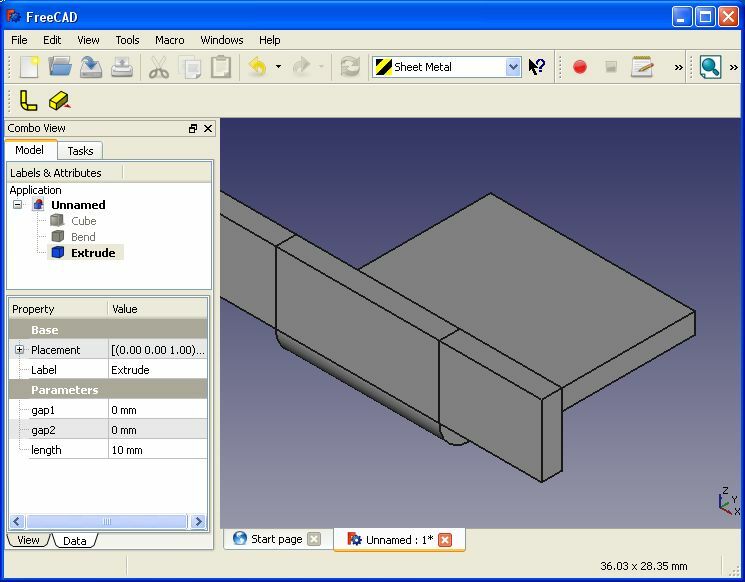 Then make a drawing using the drawing workbench, then use the “drawing dimensioning” workbench to add dimensions. Excellent tool, thank you for you’re work. In real live, we have static correction factors for situations, where the inner bending radius and the sheet metal type and thickness is defined. If no static correction value is entered the implemented k_factor calculation takes place when flatening, otherwise the static correction factor will be taken for the calculation of the ‘flaten lenght’. I was working on my project when I came across Sheet_metal addon. Its remarkably great tool! 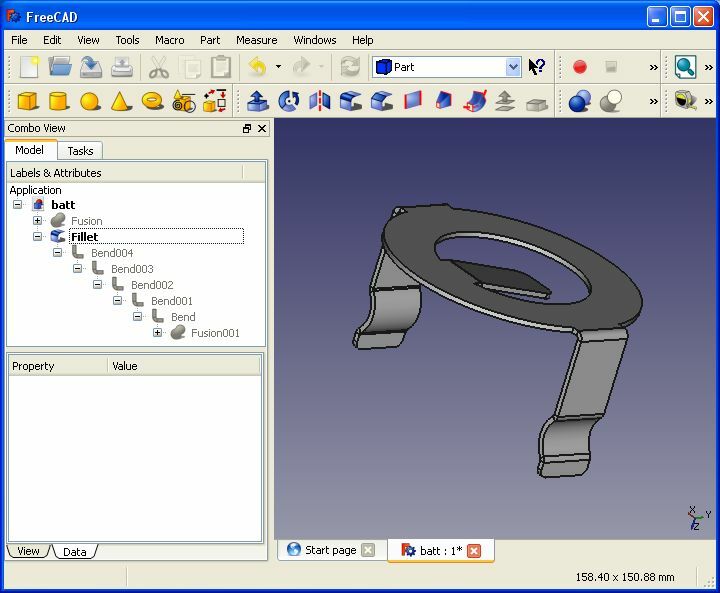 I have tried using it according to above tutorial, workds like charm even with Freecad 0.17pre. However, I was wondering if it can also be used to bend objects, that are already fully sketched in flat form and includes pockets on both flat and (yet to be) bent side. Could you please tell me, if that is possible? thanks a lot! I have been looking for something like that for a while now! Tried it on FreeCAD 0.16 on Fedora 25 and it worked without any problems. One question though, I could not see any release tags on github, is v0.0.18 the git master head or where does the development take place? Thank you for a great contribution! I have found a strange behaviour in the latest version at this date. If interested, please give me your email-address so that I may send you an example. What is the K-factor set at? Could it be possible to add a K-factor parameter so that the K-factor can be changed for different materials. Only a suggestion. The unfold function was not done by me, so I can only answer you from picking the code. It uses the following formula: K = 0.65 + 0.5 * log (radius / thickness). I had intended to make the K factor selectable, however, as said it is not my code and I could not get in touch with the guy who did it. Many thank for the great extension!! I hope this is a good place to make a small bug report. The extensions dont like angels from exaktly 60°. 59.9 or 60.1 are working well. The flatningtool is forgot the parts behind the bending. Sorry for my horrible englisch! If you want more informations please send me an email. Very useful. I need to test it with foamboard designs. Especially FliteTest’s a-folds and b-folds. Superb work, many thanks indeed! The Undo function does not seem to work for me. Anyone else have the same issue? Very nice and useful ! Nice job ! Did you install the freecad workbench using the AddOn manager? I followed the instructions and designed a box using SheetMetal. Easy and well featured. But I cant find how to add some holes. I cant work out how to make my box design the active body. If I create a new body, how do I transfer my box design into it. 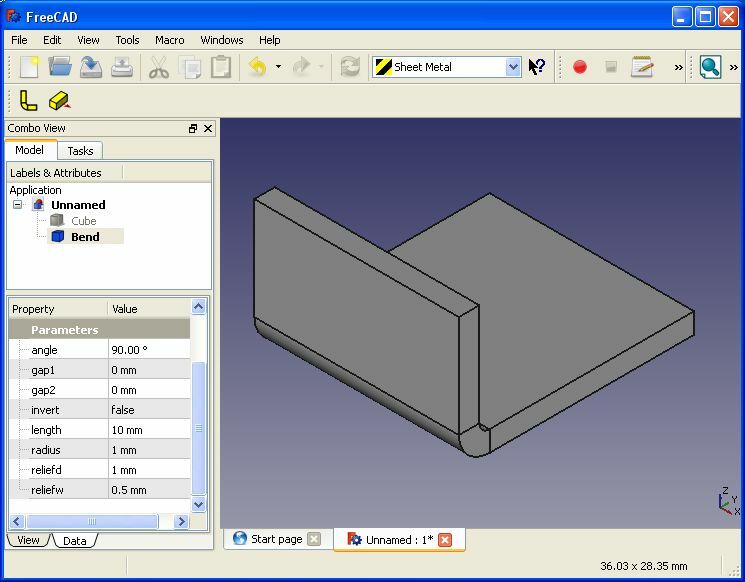 Your model was probably created outside the part-design workbench. To work with sheet metal and part design, you need to start your object with part design. Start with part design, create a new body, then add a sketch and pad it as the base of your box. Then continue with sheet metal. You can then place sketches on faces and add holes. Best way to get help is via freecad forum. I would like to how to put the K_FACTOR in the Sheet metal ADDON. Right now there is no way to set the k factor. Unfortunately the unfold code is not mine so I can not fix that. Try the freecad forum. Very good work, please continue to build the freecad strong. There are many people depending on it for personal as well as official projects. cool thing. Well I’m stuck with something. I have a sheet which is usually Laser cut and then bend. Now the place where it is bend has (in 2D) non parallel edges. Any Idea how I make the bend? Why can I not set the extension of the bend to 0? I don’t want to change the design (too much) to make it 3d drawable. The part drawn in 2D, cut and bend works already fine.